The hobbit, Bilbo Baggins, passed a quiet, uneventful life in a community that greatly prized convention and respectability. One day, however, he left his hole and journeyed off into the Blue. His adventure, though frightening and at times painful, changed him forever. His eyes were opened, and he matured in mind and character. When he returned to his hole, his neighbors regarded him as “cracked” because they couldn´t accept that there is more to life than order and predictable routine. Although he lost his reputation, he never regretted going on the adventure that enabled him to discover his true self and to experience an exciting new world. If this sounds familiar, it should. It´s Plato´s “The Allegory of the Cave,” possible the most famous there-and-back-again story ever told. Plato´s tale isn´t about hobbits or wizards, of course. It´s a parable about a man, shackled since birth in an underground prison, who venture forth and discovers that the world is far larger, richer, and more beautiful than he imagined. Plato hoped that the readers would learn a few lessons from the allegory, such as these. Be adventurous. Get out of your comfort zone. Admit your limitations and be open to new ideas and higher truths. Only by confronting challenges and taking risks can we grow and discover what we are capable of being. These lessons are essential the same ones that J.R.R. Tolkien teaches in The Hobbit. The Hobbit, one of the best-loved children´s book of a time and the enchanting prequel to The Lord of the Rings, raise a host of deep questions to ponder. Are adventures simple “nasty, disturbing, uncomfortable things” that “make you late for dinner,” or can they be exciting and potentially life changing? Should food and cheer and song be valued above hoarded gold? Was life better in the preindustrial times when there was “less noise and more green”? Can we trust people “as kind as summer” to use powerful technologies responsibly, or should these technologies be carefully regulated or destroyed, lest they fall into the hands of goblins and servants of the Necromancer? In this file I share Tolkien´s enthusiasm for philosophical questions of “immense antiquity.” Like my other pop culture files I seek to use popular culture as a hook to teach and popularize the ideas of the great thinkers, and, through this, of course also my own teaching. Middle-earth is the fictional setting of much of Tolkien's legendarium. The term is equivalent to the term Midgard of Norse mythology, describing the human-inhabited world, i.e. the central continent of the Earth in Tolkien's imagined mythological past. Tolkien's most widely read works, The Hobbit and The Lord of the Rings, take place entirely in Middle-earth, and Middle-earth has also become a short-hand to refer to the legendarium or its fictional universe. The Shire is a region of Middle-earth, settled exclusively by Hobbits and largely removed from the goings-on in the rest of Middle-earth. It is located in the northwest of the continent, in the large region of Eriador and the Kingdom of Arnor. Although most of the peoples of Middle-earth already existed in Norse mythology, hobbits are entirely Tolkien´s creation. Tolkien scholar Tom Shippey explains that they are anachronistic creatures who engage in modern activities despite their ancient setting. They smoke tobacco and eat potatoes, both of which are imports from the New World and not found in medieval England. They enjoy bourgeois creature comforts such as mantel clocks, teapots, daily postal service, brass buttons, and fancy waistcoats. They use modern grammar rather than the archaic dialects of other Middle-earth speakers. Simply put, hobbits are a representation of rural, late Victorian Englishness. In addition, they are provincials who fear the differences of others and who like it when other hobbits are reliable predictable. They don´t like weirdos, never go on adventures for fear of missing a meal, and are highly set in their traditional ways. Bilbo Baggins remains a modern person throughout The Hobbit, and this enables the reader to identify with him. But by the end he is no longer a provincial: he has seen the world, eaten foreign food, heard foreign languages, lived with strange people, encountered exotic dangers, and lived to tell about it. Bilbo becomes a cosmopolitan hobbit who recognizes that other people have valid ways of living, and he wishes good for all of them. In so doing, Bilbo steps into a particular philosophical way of living in the world (see my article Philosophical Counseling as an Alternative to Psychotherapy). Combined with the traditional hobbit qualities you could now call him an idler. If you should mention a modern English idler, which promotes all the qualities of a Bilbo Baggin´s way of life, you could mention Tom Hodgkinson (born 1968). His philosophy, in his published books and articles, is of a relaxed approach to life, enjoying it as it comes rather than toiling for an imagined better future. Together with his friend Gavin Pretor-Pinney he founded The Idler which is a bi-yearly British magazine devoted to promoting its ethos of 'idle living' and all that entails (read an additional account on idleness in my pop culture file on The Big Lebowski). Ronald Hutton´s book The Rise and Fall of Merry England: The Ritual Year 1400-1700 demonstrates how the festive culture of the Middle Ages was gradually eroded by the Reformation and the Puritans. It was in this merry time the legend of Robin Hood was formed. Robin Hood is a heroic outlaw in English folklore who, according to legend, was a highly skilled archer and swordsman. Traditionally depicted as being dressed in Lincoln green, he is often portrayed as "robbing from the rich and giving to the poor" alongside his band of Merry Men. Robin Hood became a popular folk figure in the late-medieval period, and continues to be widely represented in literature, films and television. Later in The Hobbit we discover that this idea of gift economy is shared by Bilbo, who gives most of his treasures away. Also it is seen in the hobbit custom of giving presents when they celebrate their birthdays, instead of receiving them. And Max Weber´s book The Protestant Ethic and the Spirit of Capitalism shows how the competitive Protestants booted out the cooperative Catholics; it shows how a new ethic based on work and earning a lot of money came to replace, in the eighteenth century, the old medieval ethic, which was based on mutual aid. The medieval culture (which wrongly are depicted as a dark age by the Protestant work ethic) combined a love of Jesus, who preached idleness, and a love of Aristotle, who argued that contemplation led to happiness. (I would recommend this book to anyone who wants to banish their guilt around work). Today I myself travel around in the world as a Philosophical Globetrotter, Life Artist and Idler. I campaign against the work ethics and promote liberty, autonomy and responsibility; in reality: the fine art of doing nothing. In this I take an anarchic approach to the everyday barriers that come between us and our dreams. So I'm in for spiritual anarchism, civil disobedience, and the right to be an idler. When I don´t travel I live In Rold forest, Denmark, meditating, writing, and hiking. In the forests I also offer philosophical counseling and cafés. This happens in connection with hiking or other events. In accordance with gift economy, all my services are free of charge, also my books. Like Taoist sages, the Little Folk live uncomplicated lives in close touch with nature. Their rustic, well-ordered lives, embodying a natural simplicity, allow for spontaneity. And spontaneity enables te, the power of the Tao, to surface within them so that they can be true to their nature. This is in contrast to the Big Folk, whose lives are more encumbered, who are therefore much less simple and spontaneous, and whose bigness depicts complexity, excess, and oversized ambition. The Big Folk represent the fall from grace decried by Tolkien, the fall from our natural path. The most improper job of any man, even saints (who at any rate were at least unwilling to take it on), is bossing other men. Not one in a million is fit for it, and least of all those who seek the opportunity. The ultimate principle of Tao, then, is our true and original nature. Taoism teaches that we ought to pursue our own Tao, our own journey, in a way that is consistent with this ultimate principle. The Hobbit reveals characters whose ways are troubling and downright harmful. When Thorin stubbornly insists on hoarding the entire lot of gold, silver, and gems, what makes his way questionable? His greed is clearly not the path of the Tao, so it hinders him from being true to his nature. Consider Smaug. If Smaug´s disposition is to possess treasure and relish its possession, is he cultivating the Tao? Certainly not, for his disposition is one thing; his true nature another. His disposition is such that it suppresses te, the power of the Tao. The genuine nature of all living things is to act in accordance with the Tao. I don´t know if it has occurred to you that, even if you could steal the gold bit by bit – a matter of a hundred years or so – you could not get it very far? Not much use on the mountain-side? Not much use in the forest? Bless me! Had you never thought of the catch? A fourteenth share, I suppose, or something like it, those were the terms, eh? But what about the delivery? What about cartage? What about armed guards and toll? Bilbo had not anticipated in such practical concerns. He and his companions had thought only of seizing the treasure, not transporting it. So on a purely literal level, gold, once acquired, is indeed a heavy burden. He did not reckon with the power that gold has upon which a dragon has long brooded, not with dwarvish hearts. Long hours in the past days Thorin had spent in the treasury, and the lust of it was heavy on him. Though he had hunted chiefly for the Arkenstone, yet he had an eye for many another wonderful thing that was lying there, about which was wound old memories of the labours and the sorrows of his race. Thorin is not the only character in The Hobbit oppressed by the desire for gold. Even though the Wood-elves are basically good people, their king, ever greedy to acquire more silver and white gems, has a special weakness for treasure. And when the treasure´s guardian in the Lonely Mountain is slain, men, elves, and dwarves grow increasingly bewitched to seize the gold, culminating in the terrible Battle of Five Armies. Even hobbits are not free from the weight of desire. With the buzz of Bilbo´s demise, hobbits, particularly the Sackville-Bagginses, are eager to auction of his property. Greed has a way of clouding even kind souls. And in the opening chapter of The Fellowship of the Ring, gossip of Bilbo´s hidden treasure again seizes the hobbits´ hearts. They make no beautiful things, but they make many clever ones…It is unlikely that they invented some of the machines that have been troubled the world, especially the ingenious devices for killing large number of people at once, for wheels and engines and explosions always delighted them. Goblins create their machines and have slaves do their work for them. Yet they are enslaved by their own creations, just as the desire for gold enslaves us. There is the tragedy and despair of all machinery laid bare. Unlike art, which is content to create a new secondary world in the mind, it attempts to actualize desire, and so to create power in this World; and that cannot really be done with any real satisfaction. Labour-saving machinery only creates endless and worse labour. And in addition to this fundamental disability of a creature, is added the Fall, which makes our devices not only fail of their desire but turn to new and horrible evil. So we come inevitable from Daedalus and Icarus to the Giant Bomber. It is not an advance in wisdom. For the Taoist the real problem lies not with the machines themselves but with their seductive power over us, with our willing surrender to efficiency even if it means sacrificing nature and humanity. Let us now try to look at how the ideology of needs distorts the human nature, most extreme seen in the allegory of Gollum. The body becomes hungry because you use energy; it is in need of more food, this is natural. But if you say: ”I must have the food, which is tasting best, I can only eat what I like most!”, then the unnaturalness begins. Everybody, - not only the rich, but each single human being in the world – shall have food, clothes and roof over their heads. But if these physical necessaries are limited, controlled and becomes reserved by a very few, it is an unreasonable circumstance; an unnatural process has begun. If you say: ”I must gather to house, I must keep everything for myself!”, then you deprive others the possibility for getting their daily needs covered. The problem is not simple, because we want something else than what is necessary in order to cover our daily needs. It would perhaps be enough for a human being to get a bit of food, a few clothes and a small room to stay in; but we want something else. We want to become a famous person, have a position in the society, have power, prestige, to be God´s chosen, to experience that our friends think high thoughts about us, etc. The whole of the modern management and coaching industry is based on, that all people shall think in that way. The problem is difficult, because the inner desire after being the richest and most influential human being, the desire after becoming something, only can be fulfilled through the possession of things, food, clothes and shelter included. You cling to these thing in order to become rich inwards; but as long as you in that way is dependent, it is impossible to be rich inwards; what will say: to be free and independent in psychological and existential sense. Therefore you become unhappy when you can´t get what you want, or when you lose it. Why shall we necessarily have what we want? Is it not, because we think we have the right for it? In political philosophy they have made much out of claiming that the right of ownership is a natural right, whereby you can justify waste and exploitation. A bit in the same way, as they have claimed, that conflict is something natural, whereby you can justify violence and war. And the ideology of needs is claiming the same: the desire after satisfying your needs, not only your basic needs, but also esteem needs and self-actualizing needs, is something entirely natural, and a human right. The problem is that there is a difference between actually being a self-realized person (persons who Maslow has described many times) – and then the desire after being such a person. To reduce the whole thing to needs is a distortion of what self-realization is all about. Now, if we take the human rights, then they are ethical tools. In ethics you focus on, what co-operation and conversation require of you in order to, that you at all can exist: that you speak true (don´t lie), that you are prepared to reach mutual understanding and agreement (don´t manipulate), don´t make an exception of yourself (but treat others as equals). From this rises the eternal moral values (as for instance that it is wrong to lie), and generally our ideas of right and justice: the so-called human rights, the idea about the individual person´s autonomy and dignity: you shall treat the other not as a means, but as a goal. The society-ideology of today doesn´t live up to this, because it increasingly makes people into means for the constant production of consumption in the future. And this despite, that it believes, that it is an advocate for freedom, peace and human rights, yes, that it even can use war under those slogans. So the communicative aspect of human rights (treat the other not as a means, but as a goal), has been turned into an instrumental way of treating humans as means for own goals (Machiavelli´s notorious words: “The end justifies the means”). Today we especially see this in the use of the freedom of speech as a justification for insulting other people, and as a way of promoting own (un-intelligent) viewpoints, or (un-talented) goals as an artist. We have seen it in the controversy with The Jyllands Posten Muhammed drawings. And it has become so “natural”, that talented artists, and other, more intelligent, people, or institutions, who do not want to use their freedom of speech precisely in this way, also are insulted, even from highest political levels. They are for instance called cowards. The same is seen in relation with the violation of human rights in Tibet. Why are we, in the Western world, with our tribute to democracy and human rights, not doing anything about the violation of the human rights in Tibet, when we, with a lot of fuss, are doing it other places in the world (Iraque etc..)? Because of ideology: partly the ideology of China, partly the ideology of the Western world. What is ideology? Ideology is a reflection time, which manifests itself in the thoughts of human beings, especially the thoughts´ direction towards the future. The collective manifestations of the future have either appeared in the form of rigid religious believe systems, or ideologies such as nationalism, national socialism, communism and liberalism. They all function with the implied assumption, that the supreme good lies in the future, and that the end therefore justifies the means. It has not been unusual that the means to get there have been to make humans into slaves, or by torturing and murdering them here and now, as we see it practised in Tibet by the Communist ideology of China. The ideology of the Western world is Consumer Capitalism, and the supreme good out in the future is constant increasing production, constant increasing consumption. And the means to get there is, through advertises and other propaganda, to make humans into empty consumer-machines. Freedom is only consumer-freedom: freedom to choose between as many wares as possible. Identity and meaning you only find in wares you can buy or sell. Defect consumers (as for instance the elderly and umployed) have become problematized or directly demonized. The production rush makes people sick of stress. Anxiety and depression are intensively increasing. The absolute ruling political tool is economy, and the only ethics economy allows is the “happiness” you find in consumption. According to the economists (who are the wise men in a consumer culture) we therefore are “happy” in the Western world. So Consumer Capitalism increasingly makes humans into means for the constant production of consumption in the future. And this despite, that it, as mentioned, believes that it is an advocate for democracy, freedom and human rights, yes that it even can use war under these slogans. The question is namely, whether people in the non-western countries (the poor) now also are being made into defect consumers, which you have to use force against. The essential by the human rights is the opposite of ideology: that you should treat humans as goals and not as means. Consumer Capitalism is in other words a democracy and human rights parasitic ideology. The reason why the Western World doesn´t do anything about the violation of the human rights in Tibet, is, as mentioned earlier in this book, that China now has adopted Consumer Capitalism into its own Communist ideology, whereby it has created a curious hybrid. In this hybrid the two ideologies have economical interests in common. And the spiritual values of the Tibetan people can´t be measured through the economical tools of this hybrid – these people therefore have to considered as defect consumers. In this way the violation of the human rights can be justified, both in China and in the Western world. Consumer Capitalism, or the ideology of needs, ends up in an extreme ego-fixation, totally opposite to, what human rights, and ethics, is all about. Do we for instance ever ask ourselves, why we actual ought to have what we want, when millions of people not even have, what they need? And moreover, why do we want it? Man has a need for food, clothes and shelter; but it is us not enough to get these needs covered. We want much more. We want success, we want to become respected, loved, admired, we want to have power, we want to be famous poets, speakers, we want to be prime minister, president, pope, saint. And the whole quest is being justified through management theories and coaching. So, In Man there isn´t only the natural fight in order to keep alive - that is to say: the fight for food, clothes and shelter - but there is also an unnatural fight in order to change what you are to something else, the fight of the will to power; all the time with the consequence, that you don't understand what you are, that the reality about yourself is completely hidden. Our natural needs are not the will to power, but it is the will to power when things and sense impressions tie us, both in psychological and existential sense; that is to say: in the sense, that we can´t feel happy without them, that they become our foundation of existence. The thought about, that we can´t feel happy without sense impressions - that happiness exclusively has with sense impressions to do; that happiness is constituted by lust - you find for instance in the enlightenment philosopher Condillac, who advocates naturalism and materialism. He thinks that all impulses to action have their origin in the experience of lust and unlust. These experiences are in themselves striving after achieving lust and avoiding unlust. All passions, and any will, Condillac lead back to this striving, which as experience is a kind of sensation. Naturalism has moreover got a very influential framing in the English utilitarists. Jeremy Bentham for instance claims, that all our motives can be led back to striving after lust and after avoiding pain. It is a psychological teaching of lust, or hedonism, and in narrow connection herewith also an ethical hedonism; that is to say: the conception, that the highest good is the largest possible predominance of lust over pain. Bentham would say, that this is natural; that is: a way of justifying Man´s striving after lust. But is it natural? To gather more than you need is of course lustful, and we have seen, that that to gather more than you need leads to exploitation. The necessity of a certain amount of food, clothes and shelter is no basis for, that this natural need becomes the means, with which you use others for your personal satisfaction, whether economical, social, psychological or philosophical. Therefore this, to use others to win power, position and authority, becomes exploitation. And here the need becomes unnatural. What is the reason for, that things, belongings, housing, clothes etc., have taken such an all-important place in our lives? Is it because they are necessary, or is it because the whole of our happiness and raison d´être depend on them? Everybody needs clothes, food, shelter etc. This is obvious and natural. But what is the reason for, that these necessaries have risen to become of such colossal importance and meaning, that they have become our foundation of existence? This disproportionately importance is due to, that we have tied our thoughts and feelings to the things, so that we can´t feel happy without them: they feed our vanity, they give us social prestige, they give us means for display of force. We use them for other purposes, than they in themselves are implying. That we need food, clothes, shelter, is natural and not wrong, but when we are dependent of them in order to be able to satisfy our love of lust, when the things not only become a psychological necessity, but directly an existential necessity, then they are taking an all too colossal place in our life. That way arises the fights and the conflicts for achieving and keeping the things, which we are dependent of. And this fight is unnatural. As a Philosophical Globetrotter, Life Artist and Idler, you must be able to ask yourself the question about, whether you are dependent of things in order to achieve and keep an existential happiness and meaning? If you seriously try to answer this apparently simple question, you will discover how complicated your thoughts and life of feelings are. When the things only are of physical necessity for you, you limit them reasonably; but when they become a requirement for your psychological and existential wellbeing, then they get an all-important meaning. In that way you begin to understand the satisfaction of your senses and your desire for lust. If you want to understand the true, you must break away from such bonds. In order to be able to break away from this desire for lust, you must begin with observing the needs you are familiar with, and in this is lying the right basis for understanding. Most peoples´ minds are busy with things, and it requires understanding to grasp our right relationship with them. It is not about asceticism, or love of lust, not about giving renunciation, or gather into barns, but about being yourself present in passive listening, and herein understand your natural needs, without this clinging to the things. It was this realization Buddha came to after he as itinerant ascetic in 5-6 years had practised all possible penances, where he, among other things, tried to live of one corn of rice a day. He realized that this self-torture didn't lead to enlightenment; that does instead the middle way, where you give the body what it needs, but without being in the control of the senses. When you understand this, it is no sorrow to give up things, or an eternal fight to keep them. As a Philosophical Globetrotter, Life Artist and Idler, you must be able critical to investigate and understand the difference between the natural needs, and the inner dependency of things, which creates the unnatural needs. You must begin with exposing your relationship with the things. Usually it is based on the will to power. But when does the natural need becomes the will to power? It is will to power when you, after having discovered the emptiness and worthlessness of things, still continue endowing them with a greater meaning than they really have, and thereby come in a dependence of them, so that they become an existential necessity, a necessity in order to be able to be alive and have an identity. This dependency can bring forth a certain social solidarity, but will always contain conflicts, sufferings and states of decomposition. You must try to become clarified about your thought-process. Therewith is meant that you in your daily life must seek to be your will to power - and its miserable consequences and results - present. When you realize the difference between the natural need and the will to power, then the right basis for your thinking is formed. Some kind of will to power is always the cause of conflict, to unscrupulously national hate and masked brutality. Unless you understand and get grip of your will to power, you will never be able to understand the reality, which is transcending all struggles and sorrows. You must begin with yourself as a communicative being; that is to say: with your relationship with things and to your fellow men. Yes, gold is indeed heavy. The desire for wealth and power is oppressive. Stooped under the weight of our desires, we lose sight of our original nature, our Tao. From a Taoist viewpoint, however, we can free ourselves from this weight. Attachment to gold leads to obsession, and obsession leads to enslavement. Therefore, the key lies in being free from attachment. The secret consists of detachment. The Hobbit is a tale of adventure. It is also a story of personal growth. At the beginning of the tale, Bilbo is a conventional, unadventurous, comfort-loving hobbit. As the story progresses, he grows in courage, wisdom, and self-confidence. The Hobbit is similar in this respect to The Lord of the Rings. Both are tales, Tolkien informs us, of the ennoblement of the humble. Both are stories of ordinary persons – small in the eyes of the “wise” and powerful – who accomplish great things and achieves heroic stature by accepting challenges, enduring hardships, and drawing on unsuspected strength of character and will. Hobbits in general are not an adventurous folk – quite the opposite. Hobbits love “peace and quiet and good tilled earth”; have never been warlike or fought among themselves; take great delight in the simple pleasures of eating, drinking, smoking, and partying; rarely travel; and consider “queer” any hobbit who has adventures or does anything out of the ordinary. Bilbo is an unusual hobbit in this regard. His mother, the famous Belladonna Took, belonged to a clan, the Tooks, who were not only rich but also notorious for their love of adventure. One of Bilbo´s uncles, Isengar, was rumoured to have “gone to sea” in his youth, and another uncle, Hildifons, “went off on a journey, and never returned.” Bilbo´s remote ancestor, Bandoras “Bullroarer” Took, was famous in hobbit lore for knocking a goblin king´s head off with a club. The head rolled down a rabbit hole, and thus Bullroarer´s simultaneously won the battle of Green Fields and invented the game of golf. In contrast, the Bagginses, Bilbo´s father´s side of the family, were thoroughly respectable hobbit´s who never did anything unexpected or adventurous. The conflict between these two parts of Bilbo´s makeup is frequently played out in The Hobbit. Gandalf noticed Bilbo´s adventurous Tookish side when he visited the Shire in 2941, twenty years before the events described in The Hobbit. The young Bilbo impressed Gandalf with his “eagerness and his bright eyes, and his love of tales, and his questions about the wide world.” When Gandalf returned to the Shire two decades later, he found Bilbo “was getting rather greedy and fat,” but he was pleased to hear that Bilbo was still regarded as “queer” for doing odd things like going off for days by himself and talking with dwarves. When Bilbo says good morning to Gandalf and dismisses adventure as “nasty disturbing uncomfortable things” that “make you late for dinner,” Gandalf realizes that the Baggins side of Bilbo´s personality is winning out. 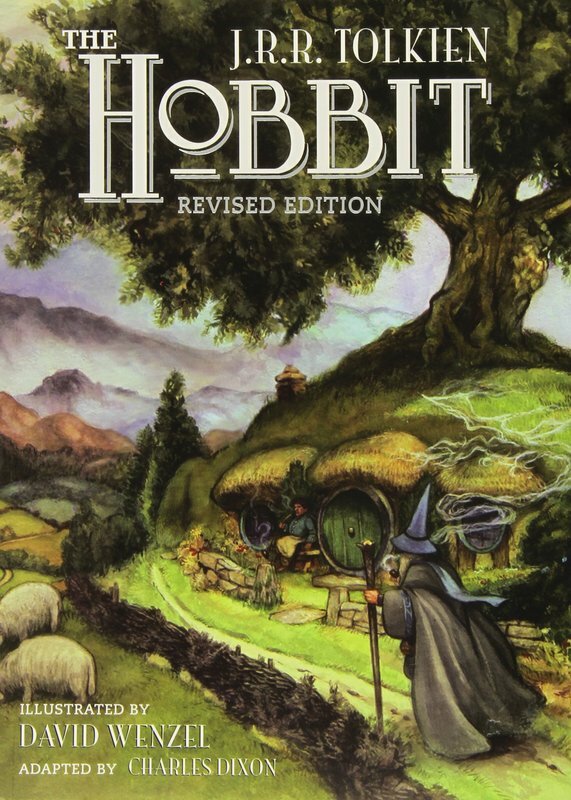 Bilbo´s inner Took is rekindled, however, by the dwarves´ treasure song and Gloin´s slighting reference to him as ”that little fellow bobbing and puffing on the mat.” Bilbo reluctantly agrees to join the dwarves´ quest and finds himself in an adventure that proves to also be a quest for his own true self. Quite early in his perilous journey, Bilbo realizes that “adventures are not all pony-rides in May-sunshine.” He is constantly fearful and dependent and often thinks regretfully of his cozy hobbit-hole with the kettle just beginning to sing. In short, The Hobbit is an adventure tale in which an ordinary and distinctly nonheroic person is morally ennobled by confronting and overcoming challenges and dangers. In that way The Hobbit manifests the monomyth about the Hero´s Journey. In his book The Hero´s Journey the mythologist, Joseph Campbell, the monomyth, or the hero´s journey, is the common template of a broad category of tales that involve a hero who goes on an adventure, and in a decisive crisis wins a victory, and then comes home changed or transformed. As a strong believer in the psychic unity of mankind and its poetic expression through mythology, Campbell made use of the concept to express the idea that the whole of the human race can be seen as engaged in the effort of making the world "transparent to transcendence" by showing that underneath the world of phenomena lies an eternal source which is constantly pouring its energies into this world of time, suffering, and ultimately death. To achieve this task one needs to speak about things that existed before and beyond words, a seemingly impossible task, the solution to which lies in the metaphors found in myths. These metaphors are statements that point beyond themselves into the transcendent. The Hero's Journey was the story of the man or woman who, through great suffering, reached an experience of the eternal source and returned with gifts powerful enough to set their society free (read more in my article The Hero´s Journey).